Description Buddha Shakyamuni sits in a yogic cross-legged position, his right hand pointing downward in the earth-touching gesture, while his left hand rests in a position of meditation. The gesture ("bhumisparsha") recalls the moment when Buddha Shakyamuni overcame physical temptations offered by the demon Mara and called upon the earth goddess to witness his resolve to achieve enlightenment. At that moment, he came to understand that the causes of human suffering lay in physical cravings. To avoid such pain and attain true happiness, one must renounce worldly attachments. The Buddha’s enlightened state is communicated by his monastic robe, which drapes over one shoulder; flames that arise from his cranial protuberance ("ushnisha"); and his broad chest filled with "prana," or the sacred breath of life. 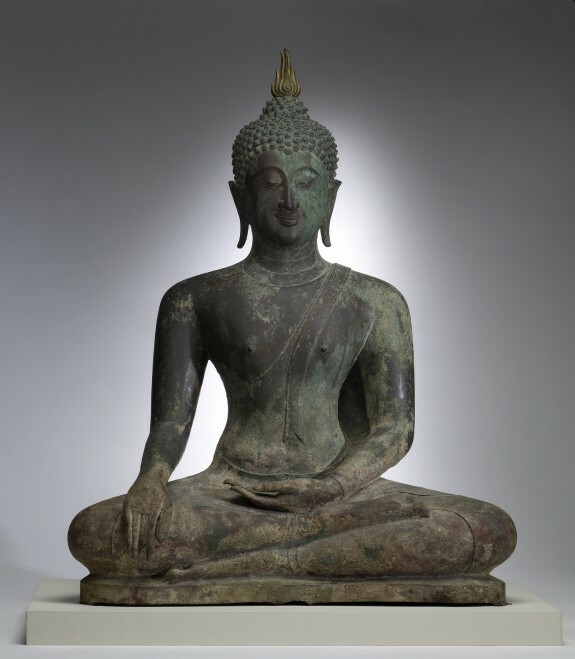 Unearthly Elegance: Buddhist Art from the Griswold Collection. The Walters Art Gallery, Baltimore. 1995.